I am home with a little cold today, so I have some free time. I will post here, my introduction that I posted on the Puzzles To Remember website. If you get a chance please check out the website: www.puzzlestoremember.org. Puzzle-solving not only helps the people who have dementia, but the people who love them. I feel so good when I work on a puzzle with grandma and she becomes so happy when the puzzle is solved! Hello, I would like to introduce myself. My name is Hailey Richman and I am 8 years old. Mr. Max Wallack has given me the important job of Assistant Director for Puzzles To Remember. Here is a little bit of my background. I have been a caregiver for my grandmother since I was four years old. I would bring things to her, read with her, draw with her, hold her hand and keep her company. Solving puzzles was also an enjoyable activity for us! I spent a lot of time solving puzzles with grandma. It made grandma and me feel good about ourselves and we would give each other a “high five” after solving one! When I was 5 years old, I noticed other residents at grandma’s assisted living facility. They seemed lonely and confused. I asked them if they would like to join us and solve puzzles too. They were so happy! Then when I got older, I wanted to do more things for others. I asked Mr. Max if he could give me ideas about how I can help even more people. He told me to set up collection boxes in post offices and libraries. I did what he told me and started getting puzzles. My mom helped me deliver them to veteran’s homes, nursing homes and assisted living facilities. Now I can do even more things! I am setting up boxes in my apartment building, school, library, post office and places that have after school activities for kids. In the spring, I will ask my principal if we can work with the assisted living facility that is near our school. Children from my third grade class can solve puzzles with the elderly patients who have dementia. My friends are also interested in helping to collect, give out and participate in puzzle-solving. Two of my buddies who go to other schools will ask their principals about collection boxes as well. I have also created a support forum for kids that are working as caregivers like me. It is called: www.kidcaregivers.com. Caregiving is not always easy, especially for a kid! I think it is important for kids to know that they are not alone. There are a lot of kids going through what I do. I think we could help each other, get ideas and tips. If someone has a problem, they can share it on my web blog and together we can help find a solution. I also have a Facebook page called: Kid Caregivers. I look forward to my role at Puzzles To Remember! 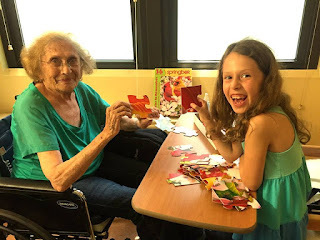 Here is a picture of me and my grandma solving a puzzle! As you can see we are excited to begin!